** Please refer Seimei, Shokou. Sunny pleasant days have been here for over a week now making us feel that we ought to go out and enjoy this pleasant weather on weekends. We see some news on TV, broadcasting that vacation spots in nature are full of people now which either turns on or off people’s minds of going out, to us, definitely going out on weekdays to avoid the crowd. If you are visiting Japan or have plans to visit Japan at this time of the year, and are planning to explore outside the big cities, it surely is better for you to go out on weekdays than on weekends. Especially driving out from big cities like Tokyo, Nagoya and Osaka would be a hectic duty as you would easily get caught in traffic jams. Getting on trains would be precise with arrival to your destination but you need to throw your hands in being squashed up in crowds of people depending on where you are heading to. Still, it is one of the most pleasant time of the year which is worth visiting, thinking out a method or a way to avoid the crowd and explore many beautiful places as you can while you are here. Bean geese heading back north. Photo from ‘Noto-no^yacho, torimi album’, a beautiful site with many wild birds that can be seen in Noto PeninsulaW. Against the merry pleasant weather, this season’s phrase describes the departure of the ‘Kougan’. 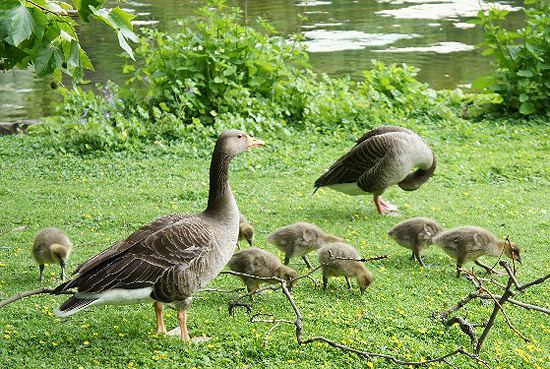 Kougan consists of two kanjiW, ‘kou / 鴻’and ‘gan / 雁’, meaning ‘bean goose or large bird’ and ‘waterfowls of duck family subsequently large to swans’. It seems complicating but is pointing out the waterfowls which migrant, big enough for people to realise when they are flying in the sky. When we look up about the waterfowls of duck family excluding swans that migrate in Japan, we have Greater White-fronted GooseW, Lesser White-fronted GooseW and Bean GooseW as major migrating waterfowls. These waterfowls have long been games for hunters until 1960’s which decreased the numbers in Japan, later in 1970’s, became Special Natural Treasures. Hiroshige’s famous ‘Wild Geese and the Moon’. One of the images of autumn. Popular among stamp collecters. A stamp from 1949. If we are to specify which goose would be the most suitable for this season’s phrase would be to look at some of the past drawn pictures of the waterfowls. Above is one of the famous ukiyoeW drawn by HiroshigeW, the “Wild Geese and the Moon” which also became a design of the stamp with the same name given as Hiroshige’s work, issued in 1949 still popular. In these pictures, you can see that the faces of the geese are like those of Greater White-fronted Goose or Bean Goose and not the Lesser White-fronted Goose. One of the ‘Gans’, ‘Magan’, the Greater White-fronted Goose. 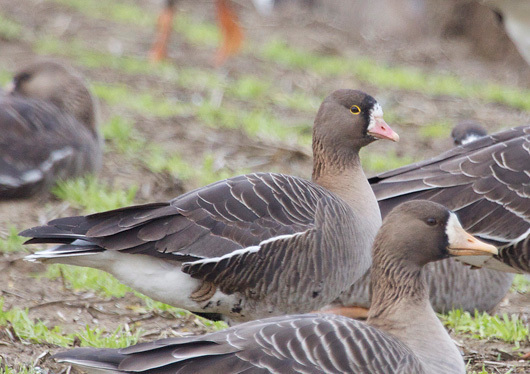 ‘Karigane’, the Lesser White-fronted Goose has a very standing out face. Photo from ‘Kaze-no Ryoma-no torimitai‘, a beautiful site introducing many Japanese birds. 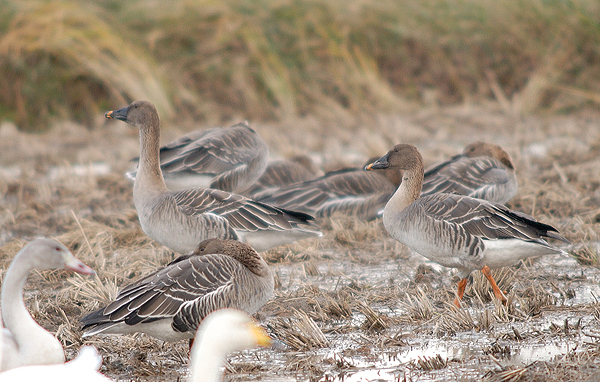 ‘Hishikui’, the bean goose. Photo from ‘Noto-no yacho torimi album‘. Another close picture of the ‘gan / 雁’ below is of Utagawa YoshitoraW, again with their heads not of Lesser White-fronted Goose though we happen to be interested in the way they were drawn while they fly like raptors diving down towards their prey… Do geese fly like that? 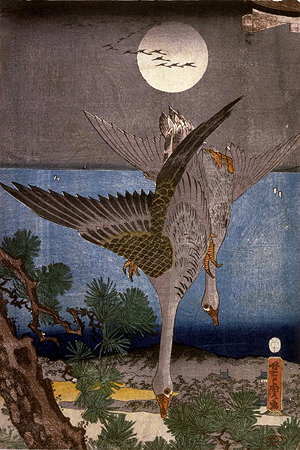 WIld geese and the moon drawn by Utagawa Yoshitora. Do geese fly straight down?? Going back to the phrase, it’s about the wild geese. The following verb is ‘kitasu’ which is not a common verb but used only in classical poetries and literatures, meaning to head north. Therefore, the meaning of the whole phrase would be ‘the wild geese heading (or going back) to north’, describing the departure of the wild geese which were in Japan during winter. 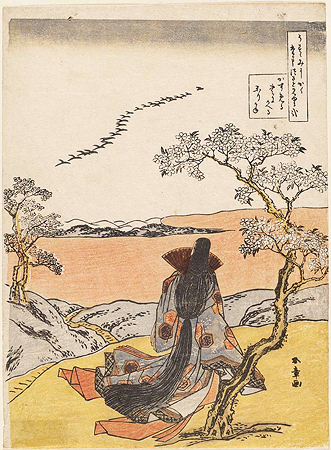 Lady of Heian periodW thinking about her lover who had left like the geese flying towards north in spring. Drawn by Katsukawa ShunshoW. Finally, when we search for classical arts on geese, we find more of them on their arrival than their departure. They are described with the harvest full moon in autumn or with snow in winter, a key seasonal symbol of coming of winter than its departure used as the arrival of the spring. 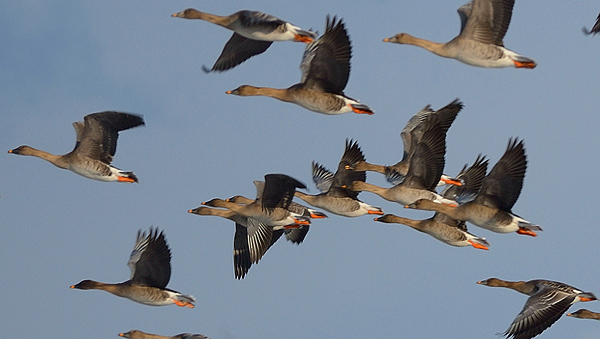 Yet in some arts, the geese are described as motifs of the separation of a couple in romance, the wild geese heading north in the sky is used as backgrounds as a metonymy. The famous novel written on a mistress of a moneylender who suffers from her desire towards a medical student, “Gan / 雁 (The Wild GeeseW)”, by Mori OgaiW has the title which points out the conclusion of the medical student’s departure heading overseas. Accepting the word as it is, you may imagine wild geese bathing in lakes to get rid of the bird louse or the dirt. We thought that was the meaning to this seasonal word but it wasn’t. The word comes from an old custom of Tsugaru area, where Tsugaru StraitW is in Aomori prefectureW. The custom of offering guests at this time of the year, a bath which hot water was heated by pieces of wood that were thought to be the geese’s was called ‘Gan Buro’ or ‘Gan Kuyo’ (wild geese memorial service). People living by the beach of Tsugaru area thought for the geese’s safe back north…. Photo from ‘Noto-no yacho torimi album‘. The reason of the name given to offering a bath to guests derives to the legend of the collected wood pieces by the beach along Tsugaru area. The wood pieces were thought to be brought by the wild geese which flown all their way to Tsugaru area, crossing the big channel. It was believed that the geese held these wood pieces on their long way over the sea so that they could rest on them by floating the wood pieces on the water. 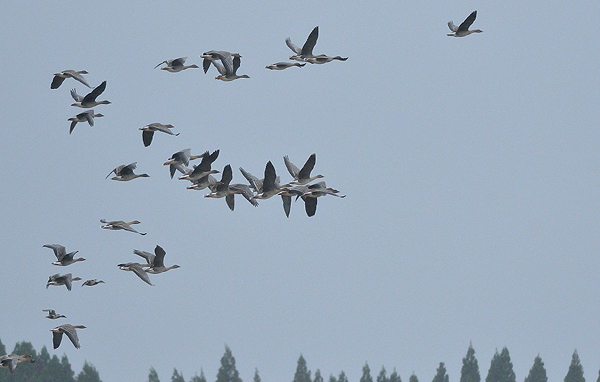 Geese would drop their wood pieces once they have landed Tsugaru area as they will not need them until their return back to the north in spring. 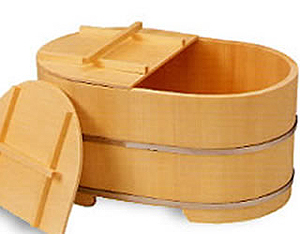 Classical type Japanese bath that used to be heated with firewood. When spring comes and that the geese depart off to north again, they would be picking up the wood pieces that they left on the beach last autumn. If all the geese were able to leave Tsugaru, there should be no wood pieces left behind on the beach but there always have been some left, calling up those who live in that area, suggestions of some geese being dead in their land, unable to leave Tsugaru. Tender hearted people of the area collected these wood pieces by the beach used them to boil the water of the bath, prayed for the repose of the dead geese’s souls, offering their guests the bath as well as asking their guests to also pray for the dead geese. 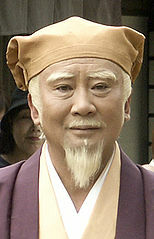 Kotaro SatomiW, one of the famous Japanese actor dressed in Mito Komon, in the popular TV jidaigeki series. Photo from Wikipedia. The action of burning insence or wood pieces relate to the belief of sending the nice aroma or what are written on the wood pieces to the divinity as Buddha or other ShintoW gods up in heaven or where gods live. Here, by burning the wood pieces meant that the thoughts of the dead geese were accepted by the people who sympathized on their death, were burnt, prayed for the response but also used the energy of the burning heat for the bath so that their guests could also be honoured in giving their thoughts to the dead geese as well as they do. The legend of Gan Buro is really a heart-warming story which is incorporated in a key story of Kamigata RakugoW, a Japanese verbal entertainment by storytellers in Osaka or Kyoto. The title of the story is called ‘Gan Buro’ with characters as Mito KomonW, a famous vice-shogunW of 17th century of Mito domainW who became a model of popular TV jidaigekiW, an Edo periodW drama. The stage of Kamigata Rakugo. 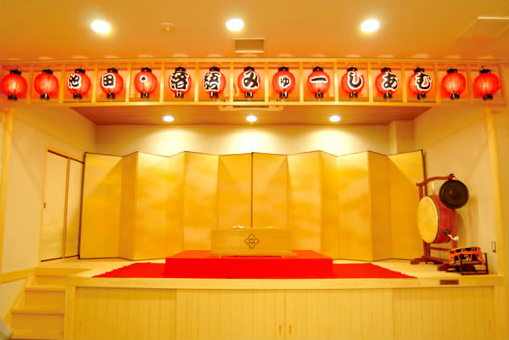 A replica live-size stage can be seen in ‘Rakugo Museum’ in Ikenda-shi, Osaka. Photo from Ikeda-shi Tourist Association Official Site. In this Rakugo ‘Gan Buro’ story, there are verses describing the painting of the wild geese as geese ought to be drawn with the moon and not with the pine trees. But as written in the former article, geese with the moon or the pine trees are both correct but the differences of the season. Many arriving geese are drawn with the moon and many departing geese with pine trees but there should be an exception like the picture of Utagawa Yoshitora’s geese above…. What season is that picture?? And, mind you, there is no proof that the migrating geese carry wood pieces while they fly over the ocean scientifically.